Different ways to take on-site registration. For many tournament organizers, on-site registration is a necessity. There are multiple ways to do this within the smash.gg tournament admin: via the attendees list, bulk add, and directly on the bracket. This article also goes over how to create and add attendees for organizers using the Death Pool format! IMPORTANT NOTE: Having a smash.gg account is NOT required to participate in a tournament. You can add a “Player”, which is a placeholder for the attendee to participate in the bracket. They can have it linked to an account later on by emailing support@smash.gg! However, it is highly recommended that when registering players on-site that you look up the correct user account especially if that attendee is participating in a ladder event, or that event that is part of a circuit. Easily add individual attendees and also add them to multiple events. Click on the “Add Attendee” button on the “Attendees List” page. You can search for user accounts via email, tag, or full name. 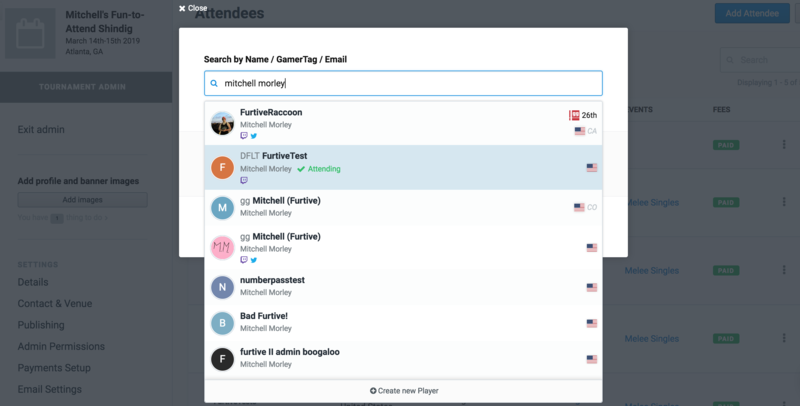 Make sure to select “Create New Player” when adding attendees without a smash.gg account. For a more detailed explanation as well as how to edit attendee info please visit this article. Also, be sure to visit this article which has more information on the adding attendee process as well as confirmation requests! Bulk add lets you add multiple attendees at once to a singles event (does not work for teams events). Best used if short on time. For more info on how to bulk add attendees visit this article. When using this method, the added player will be placed in the bracket as the last seed. Make sure to adjust the seeding after adding the player. Go to the “Bracket” tab under “Reporting” within the tournament admin. At the top of this page, click on “Edit” to toggle into "Edit" mode. At the top right, click on the button for “Add Player”. In the modal that appears, select a user account or create a player to be added to the bracket. Death pools are a way to take on-site registration without affecting the pools or bracket generated for those that pre-registered. A common use-case for this format type is to have anyone who pre-registered play in the regular pools phase, and anyone who enters at the door is placed into the death pool. Only the winner of the death pool advances into the top "x" bracket. Create a death pool phase on the "Bracket Setup" page by clicking on "Add Phase". Once general registration has ended, make the death pool the default phase in “Bracket Setup”. Via the “Attendees List” page, manually add attendees at the door. Make sure to pay attention to the phase you are adding them to! You want to make sure the “Death Pool” phase is selected. Before reporting any sets in the death pool make sure to have progressions set up. Please visit this article on how to set up progressions between phases. If you have any additional questions regarding on-site registration, feel free to send them to support@smash.gg! You can also join our weekly Q&A session! Click here for more info.